Summary: Looking for the effective way to transfer contacts from Samsung to computer? This article will show you how to back up Samsung Galaxy S9/S9+/S8/S8+/S7/S6/S5/S4/S3 to Windows PC or Mac easily in desired formats such as XML, HTML, Excel (XLS), CSV, VCF (vCard), etc. With the popularity of electronic products, few people have recorded the contact information in the phone book, thinking it is safe and enough to store contacts on the phone. However, once your mobile phone gets lost or other problems that make your contacts lost, it is quite a hassle to get back the lost contact list. So it's important to get into the habit of backing up your contacts, thus even if your cell phone is lost, the missing phone number can be recovered easily. To fix this problem, this user guide will take Samsung Galaxy S9/S8 for example and show you how to transfer contacts from Samsung phone to computer for backup. Why Do You Need to Backup Contacts? Besides the worst situation that you have your mobile phone lost or stolen, there are some other unnoticeable causes that lead to the lost or deleted contacts from Samsung Galaxy S/Note/J/A and other Android phone as well. Generally speaking, contacts data are stored in SIM card or internal memory of your Samsung Galaxy S9/S9+/S8/S8+ by default. There are many cases can cause contacts lost on your Samsung phone, such as accidental deletion, factory reset, device damage, rooted and upgrade failure. That's the reason why we need to transfer contacts from Samsung Galaxy S9/S9+/S8/S8+ to computer for backup, so that we can easily restore the backed up contacts to the phone some day if you lost them on your phone. For users who have a Gmail account, you can try to export contacts from Galaxy S9/S9 Plus/S8/S8 Plus to computer for backup. And please make sure you have synced contacts form your Samsung phone to Google account before transferring. Now, you can refer to the following instructions to transfer contacts form Samsung to computer for backup step by step. Step 1. On your Samsung Galaxy, please launch Settings app and then scroll down to tap "Accounts" option. Step 2. Select "Google" option under Accounts page. Here, if you can't see "Google" from the account list, which means that you haven't add a Google account to your device, just tap "Add account" to connect your Google account to your Samsung Galaxy. Step 3. Then please tap "Sync Contacts" option to sync your Samsung contacts to your Gmail. Just wait for a while, the syncing progress will be complete. Step 4. When you sign into your Gmail account on computer, please select "Contacts" tab from the drop-down menu on the left of window. Then click "More" option on the right of window, you will be able to see an interface of "Export contacts" where you can deal with your Samsung contacts. Step 5. 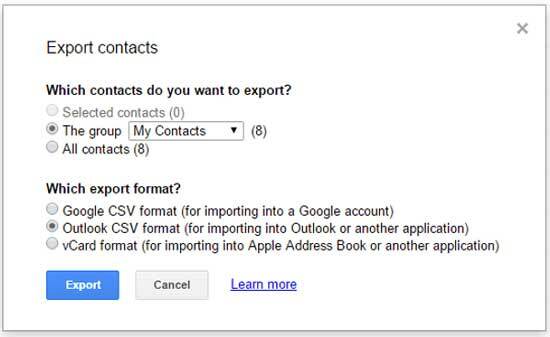 On the Export contacts window, please choose the contact(s) or contact group that you want to backup under "Which contacts do you want to export?". Then choose the desired export format under "Which export format? 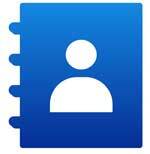 ", such as Google CSV format, Outlook CSV format or vCard format. Step 6. After selection, please hit "Export" button to moving contacts from Samsung Galaxy to computer right away. And you can check the Samsung Galaxy contacts on your computer and restore contacts from computer to Android phone. So, how to perform the contacts backup for your Samsung Galaxy S9/S9 Plus/S8/S8 Plus? I got the answer after a few tries. The Samsung Contacts Backup - Coolmuster Android Assistant (Windows/Mac) is a nice desktop app developed for Samsung users to transfer and manage the Samsung data easily and efficiently. Using the Samsung Contacts Backup program, only a few steps are needed, you can easily backup or transfer your contacts from Samsung Galaxy to computer along with all contact information of each contact, such as the attached contact names, contact numbers, contact addresses, contact email, contacts' home fax numbers, contact groups and etc. What's more, you can choose the decide the export formats according to your needs, including XML, HTML, Excel (XLS), CSV, VCF (vCard), etc. Besides, this program can also manage all the other Samsung files directly on computer, also allowing to transfer contacts, text messages, photos, videos, music, applications, books and more files from Samsung Galaxy S9/S9 Plus/S8/S8 Plus to computer without any quality loss. And this program is fully compatible with almost all Samsung devices in different device models, including Samsung Galaxy S9+/S9/S8+/S8/S7/S6/S5/S4, Samsung Galaxy Note 8/Note 7/Note 6/Note 5/Note 4, Samsung J3/J3 Pro, Samsung Galaxy A9/A8/A7/A5 and etc. This instruction will take Windows version of the program as an example, the the steps for Mac version is the same. So both of Windows PC and Mac users can refer to this user guide. Download the Windows or Mac version of the Samsung Contacts Backup - Android Assistant on your computer and install, launch it. Connect your Galaxy phone to the same computer using a USB cable and the program detects and shows it in the primary window with your device info..
Open "Contacts" category from the left sidebar and the program automatically scans out all contained contacts on your Galaxy phone. You can preview and select the contacts you need to backup, click the "Export" button to copy and export contacts from Samsung Galaxy to computer immediately. You can choose a file type from the drop-down list and select an output location to save the exported contacts.